We transfer, copy and convert DVCPro video tapes to DVD and Editable File Formats. 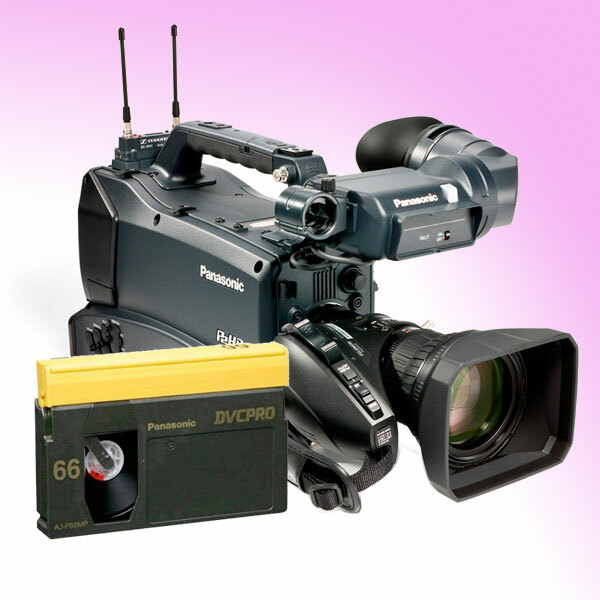 The DVCPro video format was introduced by Panasonic in 1995 and was an immediate hit with news production crews around the globe. DVCPro video has several slightly different formats. DVCPro25 is the most popular and is the format we support. Other variants are DVCPro50, DVCPro Progressive and DVCPro HD. These were mainly used for in house editing. DVCPro was also available in three different tape sizes. The two most popular were large and medium, both of which we can process. The other tape size is known as DVCPro-XL (extra large) and unfortunately, we do not transfer these. Typically, DVCPro tapes come with a yellow lid and a gray body (as in the picture). They were marked AJ-P12MP, AJ-P24MP, AJ-P33MP, AJ-P66LP, AJ-P9126LP, DP121 etc. Panasonic, Maxwell and Fuji are all brands which made these tapes..
“Thank you for your help in transferring our business video tapes to digital files. We are delighted to find a company that can provide such a broad range of video services as yourselves. The speed and attention to detail was outstanding as was your ability to deal with the wide range of formats we sent you, including DVPRO, DVCAM and MiniDV tapes. We can repair snapped, chewed up, and creased video tape as well as repairing physical damage to the cassette housing. If you have DVCPro tapes in in NTSC format, they will need to converted to PAL format to play on UK television equipment. Conversely, PAL (UK) recorded video will need be converted To NTSC for use in countries such as Japan and USA. DVCPro video tape transfer to computer editable digital AVI files and MP4 files for iPad and iPhone. Some of our customers require editable files from the DVCPro tapes for editing on a PC or MAC. We normally supply uncompressed AVI files which can play on all computer systems. AVI can be converted into any digital file format for use on any computer system or program and can be directly uploaded to Apple devices such iPads and iPhones, although you can use the video converter within iTunes to do this. All DVCPro to DVD (and AVI, MP4) conversions are done onsite. We normally like 5-10 days to turn work around, depending on how busy we are. It you need your work urgently we have a 24 hour rush service at 50% extra charge. We have been established for over 15 years and our professional DVCPro to DVD service has been used by literally 1000's of customers. NEW LOW PRICE - DVCPro video transfer costs just £20 per tape.